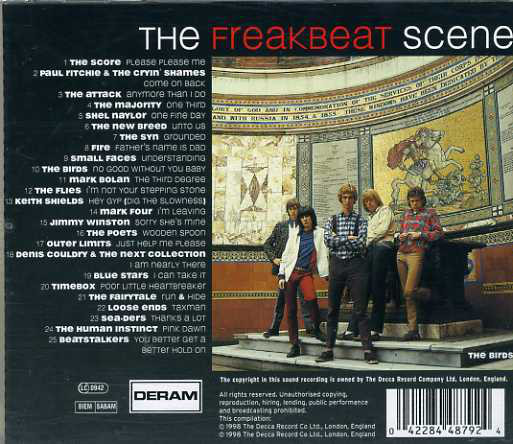 What was "freakbeat"? It was a fusion of blues and original r 'n' b with hippy, psychedelic vibes around 1966-68 in the UK. 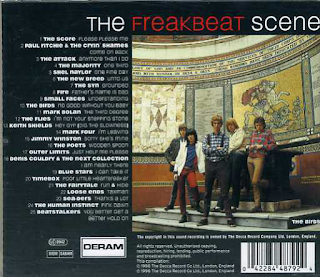 Groups that dabbled in it were The Pretty Things, Syd Barrett's Pink Floyd, The Move, The Small Faces, The Troggs, Them, The Crazy World Of Arthur Brown and some of the lesser-known acts that appear on this intriguing compilation of material released on the Decca label and its imprint, Deram. Lots of the tracks feature a swirling guitar and organ sound, lots of reverb and echoey drums. It was popular with mods, or at least the "freakier" end of mod culture, man. It was an interesting phenomenon, and, while always staying somewhat niche, its influence on many more mainstream chart singles and British pop music in general can be clearly detected. The Beatles' "Please Please Me" is given hippy-ish makeover by The Score in 1966, that, for me has echoes of Pink Floyd's "See Emily Play". It throws a completely new light on such a familiar song. "Anymore Than I Do" is a solid, drum-driven bluesy rocker from The Attack. The Majority's "One Third" is The Rolling Stones' "Get Off My Could" meets Manfred Mann and The Hollies. Shel Taylor's "One Fine Day" is a big, bassy thumping number with hints of The Big Three's "Some Other Guy". "Unto Us" by The New Breed has a catchy "Tequila"-inspired rhythm with a touch of The Stones' "Poison Ivy". It also uses Bill Wyman's trademark "reverse" bass run at one point. The Syn's "Grounded" sounds like The Stranglers would ten years later. "My Father's Name Is Dad" is a Who-inspired number with cynical lyrics that display a punk-ish observational commentary that had no relation to happy sixties pop. The Small Faces ("Understanding") and Marc Bolan ("The Third Degree") are the only artists I had previously any knowledge of, although The Birds ("No Good Without You Baby") featured a young Ronnie Wood. 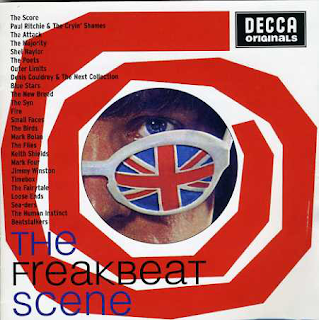 "I'm Leaving" by Mark Four is very Stones-influenced, with a bit of Bo Diddley rhythm and blues guitar in its extended instrumental middle part. It is a bit of an unearthed gem. "Wooden Spoon" by The Poets is another corker, too. "Just Help Me Please" by The Outer Limits slightly steals the riff from "Mony Mony" by Tommy James & The Shondells. Denis Couldry & The Next Collection's "I Am Nearly There" starts as a mysterious, slow number before breaking out into a madcap Arthur Brown-style chorus. Far out, man. "I Can Take It" by The Blue Stars is another frantic "Poison Ivy"/Don't Bring Me Down" type rocker. The second Beatles cover is a trippy cover of George Harrison's "Taxman" by Loose Ends. It is vibrant and enjoyable. Interestingly, I am sure they sing "I'm a taxman, I'm a black man.." at one point. Another very interesting rarity is from The Sea-Ders, who were from Lebanon, apparently, and the Eastern sound on "Thanks A Lot" was an electric bouzouki type instrument. The riff sounds a lot like The Byrds' "Eight Miles High". Surely the only Lebanese band to make an impact in the UK. Human Instinct's "Pink Dawn" had a riff that I am sure Tommy Roe would use on "Dizzy" a few years later. Look, I think you've got the idea of what this album contains by now - lots of Who-like drumming and reverb, Animals organ, Chris Farlowe meets Eric Burdon vocals, early Status Quo and Pink Floyd guitar. Rock, blues, soul, r 'n' b and psychedelia all mixed up in short, sharp two-three minute upbeat blasts. This is a most energising collection that I would recommend getting hold of in order to discover a few hidden nuggets.